Clarity in communicating how you create value for your ideal customers is vital in attracting the right visitors to your Website and in sales conversations with Internet savvy buyers. Can your sales team easily find and reuse the messaging components they need to quickly communicate with buyers around their business issues? But how to create messaging that connects capability to buyer needs and differentiates from competitors? How can you make it easy to find so that it's used consistently across the company by sales, marketing and channel teams and adapts with change over time? If you really want to connect with buyers and differentiate your offerings, then you need to move beyond simple feature/function/benefit messaging models. Bob Schmonsees Cause-Level-Value model was a revelation. Once capabilities have been mapped to the causes of buyers problems, conversation and competitive differentiation becomes a much simpler task. 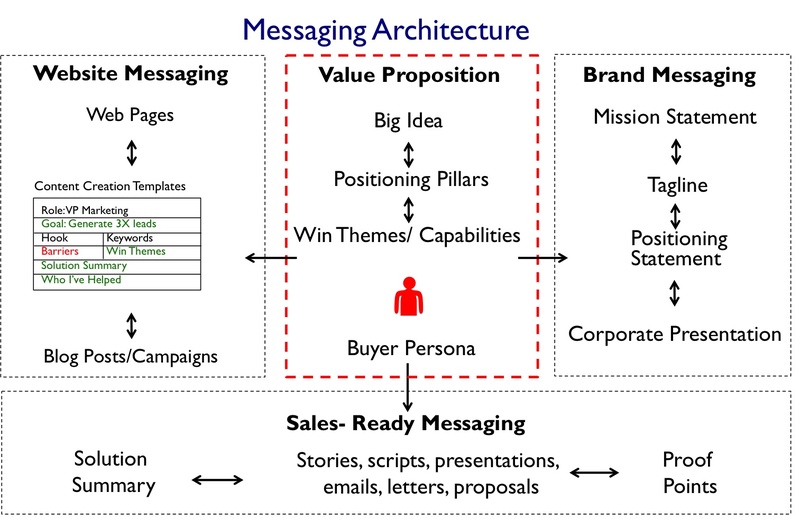 The messaging alignment process creates structured content within the same platform used to deploy the messaging and it starts with the development of buyer persona that shapes your Value Proposition in a Messaging Alignment workshop. Conversational content: Why meet?, Why change?, Why now?, Why Me? The process creates reusable content components and information products that drive Website content creation and SEO, as well forming the basis for sales collateral and sales conversations.